On 16 May 1996, Governor Tom Ridge of Pennsylvania signed Senate Bill 1441 into law. This bill contained a series of welfare reforms, including cuts to medical assistance, a requirement that childless people between ages 21 and 58 work 100 hours a month to receive medical assistance benefits, and a condition that anyone making more than $5100 a year did not qualify for medical assistance. When implemented this legislation would cut 250,000 people off of medical assistance. This came three months before President Bill Clinton’s decision to sign the 1996 Welfare Reform Bill, known as the Personal Responsibility and Work Opportunity Reconciliation Act. This act limited benefits to five years, required able-bodied people to go to work after two years in order to continue to receive benefits, prevented states from providing cash assistance and non-cash vouchers, and shifted responsibility for public assistance to the states, who would then run their own programs with federal funding. Many government officials and healthcare organizations opposed and lobbied against both the Pennsylvania state and federal reforms. In Philadelphia, Pennsylvania, an organization of poor and homeless people working to meet their housing, food, clothing, and utility needs and struggling to end poverty started a campaign against Governor Ridge’s welfare cuts. Founded in 1991 and led by Cheri Honkala, the Kensington Welfare Rights Union (KWRU) organized home occupations (actions whereby families break into federally owned abandoned houses to stay together) and housing encampments (actions whereby a group of homeless people construct a camp in the city) around Philadelphia to meet their needs and bring greater visibility to homelessness. KWRU is named after an extremely poor neighborhood of northeast Philadelphia that was once one of the most important industrial areas in the Unites States. On 25 August 1996, Philadelphians living in poverty and homelessness organized through the KWRU began a 140-mile march from Philadelphia to Harrisburg, the capital of Pennsylvania. Before they left, they held a rally at Ridgeville, a housing encampment they had built earlier in the summer to call attention to Governor Ridge’s decisions to cut medical assistance to the state’s poor people. Patricia Ireland, president of the National Organization of Women, and Marian Kramer, co-chair of the National Welfare Rights Union, spoke at the rally. About 40-50 protestors began their week-long march to the state Capitol building. The journey was difficult and a few had to drop out to receive medical treatment. A few members of the group Empty the Shelters joined the march in support. Cheri Honkala and the KWRU stated that the march was to protest the state welfare cuts. They aimed to reverse the cuts in the state reform bill. In order to do this, they demanded a meeting with Governor Ridge. At the same time, they also wanted to express their anger with President Clinton’s decision not to veto the federal welfare proposal and the lack of sufficient shelters for homeless women and children. Following their initial rally, the campaigners established an encampment in the Capitol building, which they also called Ridgeville. Their actions attracted the attention of lawyers, social workers, media, labor unions, and students. On 24 September, the State Senator Vincent J. Fumo of South Philadelphia served the eighteen occupiers, including two children, a $650 catered meal. During the occupation, the Pennsylvania AFL-CIO (the federation of labor unions) sent food for the protestors. On 26 September, governor’s press secretary Tim Reeves woke up the occupiers at 7:00 a.m. to announce that Governor Ridge was arriving. Honkala was annoyed by the surprise and further frustrated by the Governor’s quick forty minute conversation. She felt that he came to talk at them rather than engage in real dialogue. On 27 September, a federal judge ordered the occupiers to leave. They slept outside on the front steps and returned to occupy the building during designated business hours. When the Ridge administration attempted to enforce newly written rules to prohibit events on the Capitol premises after 8:00 p.m, the occupiers sought a temporary restraining order to block the new rules. The judge ruled against the KWRU protesters. On 3 October, the police packed up the demonstrators’ sleeping bags, food, clothing, and tents and removed them from the front steps. They did this while everyone had gone to take the regularly scheduled public tour of the governor’s 26,000-square foot mansion, which was maintained with $1 million a year out of state taxpayers. However, public tours were canceled that day and the occupiers were turned away. The occupiers were forced to return to Philadelphia. Though they did manage to speak with Governor Ridge, they were not able to affect any change in the decisions already made. In the following year, 1997, the KWRU organized further actions as plans were unveiled explaining the specific changes required by state and federal law. In January, the KWRU blocked rush hour traffic in Philadelphia joined by union leaders and university students. On 3 March 1997, Pennsylvania implemented the new state welfare reform plan, including TANF (Temporary Assistance for Needy Families program). The KWRU organized a sit-in occupation at a jobs center in Philadelphia in protest. The KWRU adopted a human rights framework in June 1997, arguing that economic rights and the right to housing, education, food, and a living wage are also human rights as outlined in the Universal Declaration on Human Rights. So on 21 June 1997, they began a ten day, 125-mile march with 200 people from Philadelphia to the United Nations building in New York City. They called themselves the “Poor People’s Army”, carrying American flags and wearing white t-shirts with camouflage pants. This action led to the development of the Poor People’s Economic Human Rights Campaign, a national network of poor people’s organizations that aimed to end poverty and homelessness. Cheri Honkala became the national coordinator and has continued to lead marches and protests, including at least four annual anniversary protests of state’s implementation of the reforms. Associated Press. “Welfare Protesters Evicted.” The Philadelphia Inquirer, 4 October 1996. Web. Associated Press. “Welfare Protesters Reach Goal.” The Philadelphia Inquirer, 2 September 1996. Web. Baer, John M. “Ridge Visits Protest.” Philadelphia Daily News, 27 September 1996. Web. Feemster, Ron. 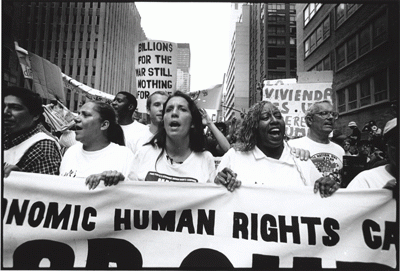 “Economic Rights are Human Rights.” Shelterforce Online, May/June 2004. Web. Fried, Daisy. “Cheri’s Jubilee.” Philadelphia City Paper, 29 August 1996. Web. “Homeless Hero.” People & Power. AlJazeera English, February 2008. Kensington Welfare Rights Union. “The Criminalization of the Poor.” Journal of Law and Social Change 5(1). University of Pennsylvania, 2000. Web. “Marchers Protest Welfare Law.” The Record. 1 July 1997. Web. Moran, Robert. “Welfare Activist Camping in Capitol get the Boot.” The Philadelphia Inquirer, 28 September 1996. Web. Naedele, Walter F. “Compassion Fuels this Lonely March.” The Philadelphia Inquirer, 29 August 1996. Web. Naedele, Walter F. “March a Bit Rocky at Times Activities Take to Raod to Protest Welfare Cuts, Lack of Shelters.” Pittsburgh Post-Gazette. 1 September 1996. Web. Pray, Rusty. “Welfare Marchers Annoy Drivers, Avoid Arrests.” The Philadelphia Inquirer, 23 January 1997. Web. Reeves, Frank. “Group of Homeless People Denied Tour of Governor’s Mansion.” Pittsburgh Post-Gazette, 27 September 1996. Web. Stark, Karl. “PA Offers Welfare Overhaul Proposal.” The Philadelphia Inquirer. 4 January 1997. Web.